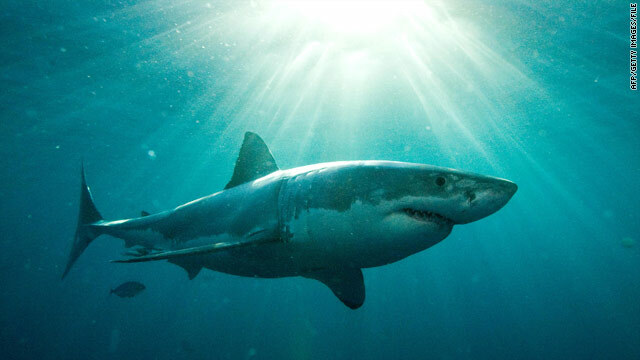 The waters off South Australia are rife with great white sharks. A longtime commercial diver apparently was killed by great white sharks Thursday off South Australia. Peter Clarkson, a well-known abalone expert, was attacked by two sharks as he returned to the surface from a dive, boat captain Howard Rodd told authorities, according to the watersport site Swellnet. Clarkson reportedly once provided a written testimonial for an electronic device called Shark Shield. However, it was not known whether he was using the device at the time of the attack, and the Shark Shield website had no testimonial with his name on it Friday. Divers in the shark-filled waters off South Australia often use shark cages, but Clarkson was not in a cage when he was attacked, police Senior Sgt. Mick Walsh told Adelaide Now. Clarkson was well-liked and respected in the diving community, reports said. He co-wrote a book on cowries, another type of sea snail. "He was a fitness and health fanatic. He was a bit alternative but he was always a decent bloke," a friend told Adelaide Now. The abalone trade is a $50 million annual industry in South Australia, according to Adelaide Now. Abalone are large mollusks whose flesh is used in cooking and medicine and whose shells are lined with mother-of-pearl. Clarkson is the second diving partner Rodd has lost to sharks. In 2000, his boat overturned; he swam eight miles to shore while his companion, Danny Thorpe, clung to the boat, the Australian network ABC reported. The only traces of Thorpe ever found were a shredded life vest and a battered lunchbox. Our time on this Earth is already set. It was his time to exit and he did it where he loved to be. When my time is up, it better not be in a car accident or at work! why didnt the shark eat you instead.. He would have made it if he wasn't wearing his lucky ham. Sorry, couldn't resist. He died doing what he loved. People hate that saying, but it's true. He knew what he was doing, it wasn't a shark attack. A shark attack is when you're in the shower and one comes up the stairs in YOUR HOUSE, and attacks you. We are in their territory, to say kill them all is very immature. I think moxie put it brilliantly. As to redd52, you make those trite comments when people say stupid things about murderers, people who know what they are doing to other people. If it were my sibling or other, I would obviously say the same because I knew where he was coming from, what he was about. He knew the risk, again, obviously anyone around him would also. It's March 10. Why is this being posted as news? The way I see it, he knew the risks and it's the cost of doing business. You cannot weigh human life vs shark life. This is sad for his loved ones but sharks should not be blamed for this anymore than fire should be blamed for burning wood. It's how they roll. I wonder if hes busy blaming Israel for the shark attack. Nope... not an arab or a muslim. I guess the sharks saw that Snickers commercial. Good to see someone is feeding the sharks. Now what happened to those Chum Salmon that are supposed to feed the Eagles in Canada? Stop hunting the sharks !!!!!!!!! Leave the poor sharks alone . He knew it was dangerous, it was only a matter of time.